Brewing your own kombucha is a fun DIY project. Storing your creation in the best kombucha bottles with the most appropriate technique will deliver a healthy drink that will help to improve the well-being of your gut microbiome. We’ve researched and discovered ten top-rated kombucha bottles of 2019, as well as the worst one you may want to avoid. Why is batch brew better than continuous brew kombucha? After looking at many different options that are currently on the market and testing out a variety of bottles, we found the best kombucha bottles of 2019 to be the Zuzuro Glass Kombucha Bottles. This pack includes a total of six bottles, each providing storage for up to 16 oz of your kombucha brew. These bottles are clear, giving you the ability to see the kombucha without having to pour it into a glass first. The easy swing cap design makes removing the lid and taking a sip quick and easy. Furthermore, the gasket sealing technology used in the caps make these bottles more ideal for longer-term storage and ensures that the kombucha will remain carbonated while in storage. If you are looking for the best clear kombucha bottles that will be an ideal solution for storing your kombucha in the cupboard and the refrigerator, then the Clear Swing Top Grolsch Glass Bottles might be the perfect option for you. 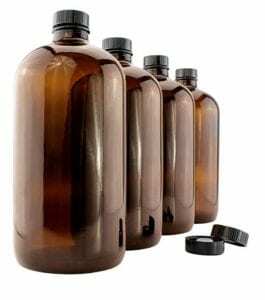 This is also a pack of six bottles that are not only a perfect solution for storing your brewed up fermented tea but can also be used for other drinks such as kefir and beer, according to the manufacturer. The caps have been designed to ensure they are reusable and can provide an air-tight seal, which will ultimately help to keep your kombucha fresh for a longer period of time, while also ensuring it stays frizzy even when you store it and do not consume the drink immediately. If you are rather looking to buy the best large kombucha bottles, then you should consider the Two 1-Gallon Glass Kombucha Jars pack by Cornucopia Brands. This pack comes with two large bottles that are perfect for storing your kombucha. In addition to a durable glass construction, both bottles come with a cotton cloth that can be used to cover up and act as a filtration system for pouring your brewed kombucha into the storage unit. Two plastic lids are also included that can be used to properly seal the bottles when you want to store your fermented tea after you are done with the brewing part. The package also comes with rubber bands to ensure the cloth covers can be fastened properly and avoid potential mishaps. Next up is the Grolsch Glass 11 oz Bottle Airtight Swing Top Seal Storage Units. These bottles were made by the Cocktailor brand and provide an adequate storage solution for smaller batches of kombucha. The swing top caps also makes it easy to open up and seal again for storage, while the sealing technology that has been utilized in the manufacturing of the caps ensure that the internal content will not lose its carbonation or freshness, even when the product is stored in the cupboard or the refrigerator before you drink it. These bottles can be purchased separately, or in packs of either six or twelve, depending on how many bottles you need for the kombucha you will be brewing. These are unique storage bottles for kombucha that provides you the ability to store 32-ounces of the fermented tea in each bottle that comes included in the Amber Kombucha Growler Bottles 32 oz 4-Pack with Polycone Phenolic Lids. The pack also comes with four bottles, which equals around one-quart in total storage space. The specially designed phenolic lids that come with these bottles ensure that you can store your kombucha for extended periods of time without risking losing its fizziness. The lids also ensure proper sealing to help maintain the freshness of the fermented tea you are storing. In addition to providing the perfect storage solution, these bottles are also promoted as being an ideal solution for the second fermentation, which allows you to add additional flavor to your kombucha. We found the best swing top kombucha bottles on the market at the time of writing this review to be the Giara Bottles with Chalkboard Labels. These bottles are manufactured by a relatively popular brand, known as California Home Goods. They provide you with 33.75 oz storage capacity per bottle, which is somewhat more than many of the other bottle packs that are available. These are ideal solutions for opening up a bottle of kombucha and serving it to more than one person, and also provides a more appropriate option for brewing up larger batches of the fermented tea. The swing top caps also provide an easy way to open the lids, as well as the ability to seal the bottle to avoid the kombucha losing its freshness. If you are planning to serve up larger batches of kombucha, perhaps to the entire family or to a group of friends, then the Amber Glass Growler Jugs would be a perfect way to store your kombucha. These jars can hold up to 64 ounces of kombucha, and they come with phenolic lids, which means they will provide a better seal as compared to many of the alternative options that are currently available on the market. These lids ensure that carbonation can be kept at a maximum level, even with extended storage times. Each pack comes with two jars, making it ideal to brew up two different flavors of kombucha. The Chef’s Star Case of Twelve 16 oz Easy Cap Bottles provides a way for you to store a larger batch of kombucha in smaller-sized bottles. Each bottle provides an ideal serving size of this fermented tea drink, without being so large that you would not to reseal and risk losing some of the carbonation. The easy cap provides an effortless way to open up the bottles, while still sealing adequately to avoid losing fizziness or freshness. Each pack comes with 12 bottles, ensuring you have adequate storage space for larger brews of your favorite kombucha flavor. In addition to including several bottles that help you easily store your tea, the pack also comes with a cleaning brush, as well as fennel to make it easier to pour your kombucha into the bottles. The Healthy Harvest Half Liter Glass Bottle pack provides a way to securely store your kombucha without having to worry about factors such as CO2 escaping every time you have to open and close the bottle. There are 12 bottles in each pack, and each bottle can hold up to 500 milliliters of kombucha, which is approximately 16 oz. These bottles also come with a swing cap to provide a perfect way to seal your kombucha tightly to avoid losing its carbonation or its flavor. These bottles have been designed to exhibit an antique look and provide a more secure way to store your kombucha. The final option that we want to include in our list of top bottles for kombucha this year is the Chef’s Star Case of Six 16 oz Easy Cap Bottles. These might look pretty standard, but they do come with several benefits that make them an ideal solution for anyone who wishes to purchase high-quality bottles that will help them store their fermented tea. These bottles are made from high-quality glass to provide a more durable operation and a reduced risk of breaking. Furthermore, the rubber gaskets that have been used in the caps provide a way to seal the bottles and liquid inside, reducing the risk of allowing CO2 to escape from the fermented tea. If you are serious about brewing kombucha and would like to buy good quality bottles for storing your tea, then we recommend you avoid these kombucha bottles. The primary reason for this is the fact that the Cobalt Blue EZ Cap Kombucha Bottle are not clear and provides a color that makes it difficult to see your tea – you need to make sure that your tea is fresh and has not gone off before drinking. For this reason, it is usually a much better decision to opt for a batch of bottles that are clear and does not have a particular color that would cause you to have to pour some kombucha into a glass to ensure it is still good every time you want to drink it. Additionally, the bottles have been known to arrive broken from the manufacturer. There are quite a significant number of choices on the market that can be utilized for the storage of a kombucha brew. Some options come included in a complete kombucha brewing kit. Unfortunately, not all of these bottles are ideal for a fermented drink. Below, we will take a look at some important points that should be considered when looking for the best kombucha bottles on the market. Available Storage Space: There is no use in buying a lot of bottles when you will not have enough space to store all of them. Thus, one of the first points that you need to consider when looking for kombucha bottles to buy is the storage space you have available. When you consider how much space you have for storing bottles of brewed kombucha, it will also help you determine how much kombucha you should make in the first place – making too much kombucha means you need to fill up more containers, leading to a larger space requirement. Your storage options may be more limited when choosing to keep your kombucha in the refrigerator. You could decide to allocate some space in the refrigerator for keeping a couple of bottles cold, while the excess bottles that you have are stored away in a cupboard. Sealing Technology: The seal that is fitted in the bottles that will be used to store your kombucha will play a major part in keeping your fermented tea fresh and maintaining the high levels of carbonation. Many brands have introduced special technologies to help improve the sealing technology of the lids, whereas other brands utilize standard options that have become popular. Regardless, you always need to consider the fact that better sealing technologies will be the better solution to keeping your kombucha fresh. When the lid of a bottle you use to store your kombucha in does not seal properly, then CO2 can easily escape and, in turn, this will reduce the carbonation of the drink, leading to a lezz fizzy kombucha. Bottle Size: In addition to the sealing technology, you should also consider how large the bottles are that you will be storing your fermented tea in. This does not only go hand-in-hand with the first point we have mentioned here, but also has an impact on keeping your kombucha fresh and fizzy, similar to a healthier soda made from a soda machine. It is known that smaller bottles lead to better carbonation – this is because each time you lift the seal and open the lid, some of the CO2 will escape from the bottle and reduce the kombucha’s fizziness. When the bottles are small enough to provide a single serving of kombucha, there will be no need to open a single bottle multiple times, which means CO2 will not continuously escape and lead to non-carbonated fermented tea. When brewing kombucha, you can either opt for batch brewing or continuous brewing. A lot of people who are new to make their own fermented tea are not entirely sure what procedure they should follow. There are many similarities between these two options, after all. For individuals who are new to the entire process, brew batching is often a recommended option. For starters, brew batching is known to be much more affordable as compared to continuous brewing. It is also easy to start with this particular procedure, and once you have your kombucha scoby, this method produces enough kombucha if you want to give this fermented tea a try without wanting to create large amounts of the tea. This is also perfect if only one or two people will be enjoying the tea, whereas continuous brewing is rather a solution for an entire family. Once you have brewed up a batch of fermented tea, or kombucha, then it is essential to store the drink properly to ensure it stays healthy, carbonated and delicious. While it is possible to store the kombucha in the jar you brewed the drink in, many people find that buying special bottles for kombucha is a better solution. We looked at the best kombucha bottles of 2019 in this post to help you buy the right containers to store your fermented tea in.